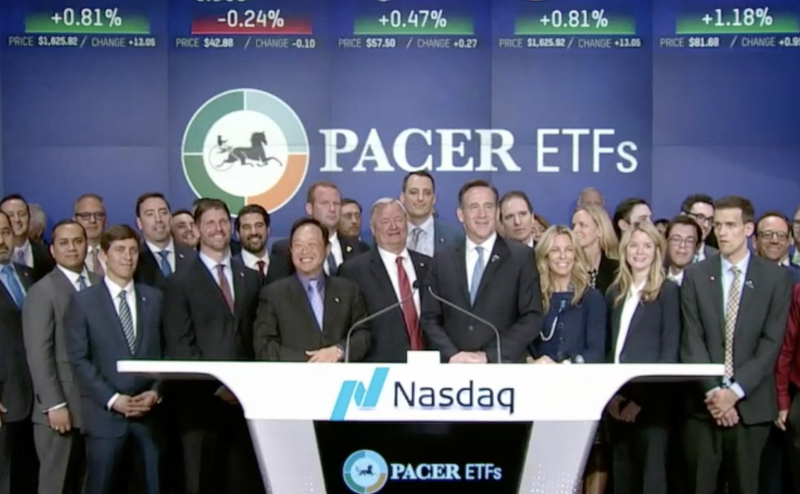 May 30, 2018, Vienna, VA: Military Times, in partnership with Pacer ETFs and VETS Indexes, has recently listed a new investment fund on Nasdaq under ticker symbol “VETS” and today was the official bell-ringing ceremony. The Pacer Military Times Best Employers fund is based on the Military Times Best for Vets Employers rankings. For these rankings, Military Times queried companies across the nation with a 90-question survey delving into their veteran-related recruitment, culture and policies. Military Times ranked companies based on their responses and VETS Indexes used these rankings as the basis for including companies in the fund, which Pacer then licensed. Investors can now find this VETS index on Nasdaq. VETS Indexes has pledged to contribute as much as 20% of its net profit to veteran-related charities, and Pacer has pledged to take 10% of their management fee and contribute it to a military-related charity. The President of Pacer ETFs, Sean O’Hara, summed it up nicely when he said, “We don’t have anything without our veterans.” Now investors have a way to put money into companies who are doing good things for veterans and have the potential to make good money while doing it. At the heart of our suite of Indexes is a core belief that the mission critical mindset, unique skill sets and specialized training that US Military Veterans bring to the workplace are differentiating factors in an enterprise’s overall performance. While these attributes and the Veterans themselves are not the only driving force behind any company’s success, we believe that the recognition of their value by these firms indicates a more well governed and more well run corporation. We are proud to contribute a significant portion (target of 20% and at least 5%) of our net profits to charitable organizations that support the wellness of our Military Veterans and their families thereby providing investors a way of doing good while doing well. Headquartered in New York, the company is building a family of impact indexes all of which emanate from those firms most supportive of our nation’s military veterans.